Although one of the most enjoyable shows that I can remember was one performed from behind an old upright piano, most of us aspire to a specially designed fit-up for our shows. Even the most beautifully cut diamond may be enhanced by the right setting. 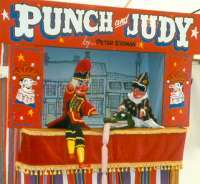 Considerations of portability and functionality aside, the most important element of the Punch booth is the proscenium. This is the frame of the picture you are presenting to the audience, the focus of your performance. Its design deserves a great deal of thought. Firstly, ask yourself what you require from the proscenium. It can be more than a mere picture frame. 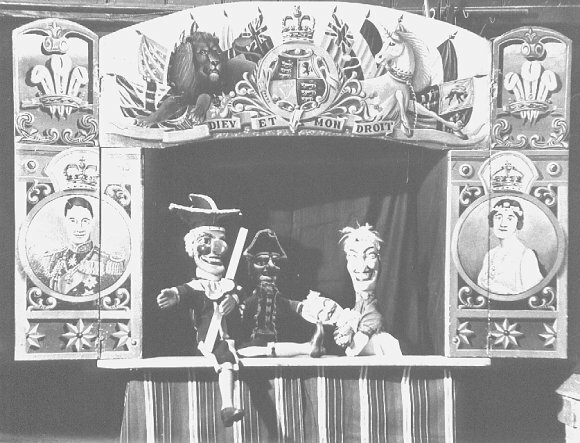 Of course the primary function of the proscenium is to focus attention onto the puppets but it can also be a decoration, part of the scenery, or an advertisement. 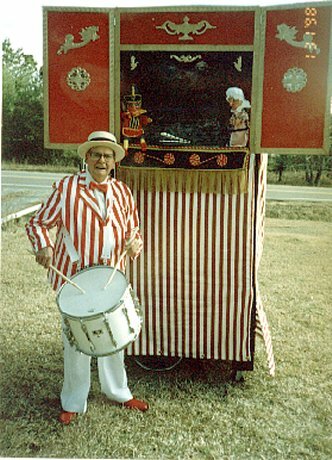 Pete Stedman, in his teaching video, makes the point that what is appropriate on the fairground is not necessarily suitable for the drawing room. He is speaking of his booth covering which, for his indoor shows, is a rich regency stripe fabric rather than the more gaudy stripes we normally associate with a Punch fit-up. 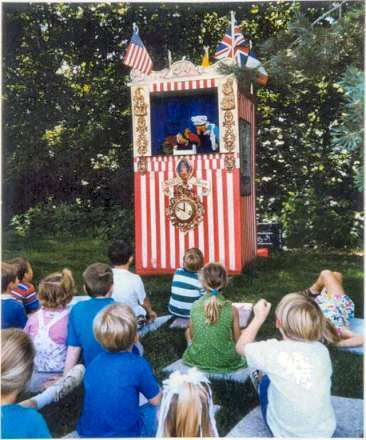 Exactly the same argument can be applied to the proscenium, what is wonderfully eye catching among the stands and marquees of the carnival could appear monstrous in little Johnny’s playroom. Before considering the decoration of your proscenium you must consider the proportions. It must appear pleasing to the eye, and must lead the eye to the puppets. To my mind Prof. Kincaid’s booth looks far too box-like. I prefer a proscenium that is rather wider than the booth uprights, but this can be overdone. The Rosella design is far too wide to be pleasant on the eye, and is so busy pictorially that it detracts from the puppets. Prof. Frank Bryne also sports a proscenium too wide by far, but he can’t be accused of over-decoration. The one below goes to the other extreme, and doesn’t seem quite right. If you favour a wide proscenium then perhaps that of Prof Rozelia, although so similar to the Rosella one, seems better proportionally. I personally like the simple and elegant design of Chris van der Craats. The Geoff Felix booth sports a beautifully painted and well-proportioned pros. although I am dubious about the colouring, which doesn’t seem quite happy, appearing above the broad red and white stripes. As far as decoration – lettering and design – is concerned you must again think of what you want the proscenium to achieve. The commercial approach of including name and telephone number is probably a good idea for public outdoor shows. Pete Stedman’s booth is a splendid modern commercial design that looks attractive, and will attract the crowds. It would not be suitable, however, were you re-creating a Victorian show for school use, or for a nostalgia theme event. In such cases you might consider the classical Codman look, or something rather different like that of the Rhyl show of 1910. There follows a list of things to think about. You will probably discover that there just isn’t one ideal design. Most of us are still searching. Well proportioned, pleasing to the eye. 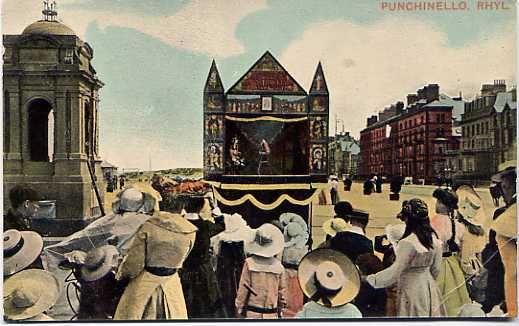 Decorated to identify the show as a Punch show rather than just any puppet show. Decorated to appear enticing, attractive and interesting before the show begins. Remember that the puppets can be dwarfed by an overlarge proscenium and that an over-decorated one can prove a distraction. Your contact information can, occasionally, bring extra bookings. Choose the colouring of the proscenium and the tilt of the booth as you would select a necktie to wear with a shirt and suit. Consider matters of transport when designing – an elaborate proscenium can make your whole bundle too heavy, or too unwieldy. Also avoid bits that can be easily damaged or knocked off. Consider having more than one interchangeable proscenium, each fulfilling a different function. Finally, have a look at the very many examples on this website. Decide which ones you like best, and try to analyse why you like them. Try and incorporate the best features of those you like in the one that you design for yourself. ABOUT PROSCENIUMS I assume that by proscenium you mean proscenium opening?. 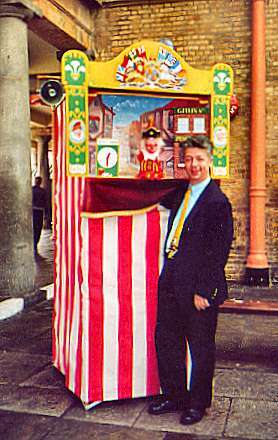 There's no standard size Sean, it depends on the height of the booth and the height of the performer. The top of the proscenium opening is more or less the top of the booth. 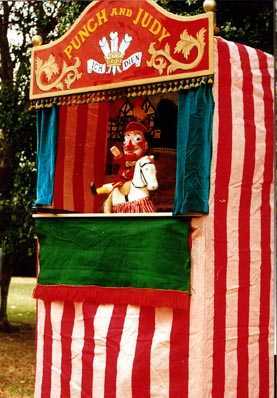 In the case of a hands-above-head fit-up and a standing performer the playboard is usually an inch higher than the height of the performer. Therefore the height of the pros opening is the height of the booth less one inch, less the height of the performer. Actually at 3 foot your opening is wider than the norm, since most portable booths are only 3 feet wide so the prosc opening width is usually less. 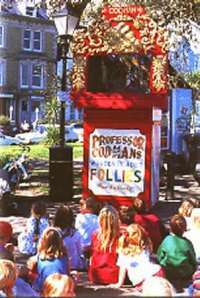 The considerations apart from your height, method of operation, and height of booth are the proportional appearance of the proscenium and the height of your Punch (or tallest puppet). Aesthetically, like a picture frame, the proportions of height to width should look pleasing. Traditionally prosceniums for comedy theatre are high and narrow while tragedy is served best by a much wider proscenium. But the actual shape of your opening can be disguised by the shape and proportions of the proscenium Surround. There are many, many prosceniums shown in the photographs on this website (especially in the Festivals gallery). There's nothing to stop you having a look, and maybe even using a ruler to measure the various widths and heights - and scale up (guided by fact that many booths will measure 36 inches across) - to give you an idea of the variety of sizes which, I would guess, will fall between 17 and 22 inches. 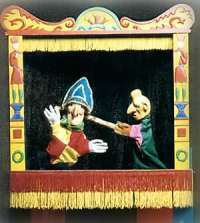 Remember a very big elaborate proscenium dwarfs and draws attention from the puppets, whereas a smaller opening and a simpler surround does flatter the puppets. However the huge, elaborate pros does look impressive between shows at a public event.